We are thrilled to announce that Eco Minded Solutions has been awarded a San Diego Beautification Award from the California Landscape Contractors Association (CLCA) San Diego Chapter for the third year in a row! Recipients of CLCA awards are highlighted for their excellence in landscape construction and maintenance through competition among California licensed landscape professionals. We would like to extend a huge thank-you to our hard-working team of landscapers, designers, and builders. It is because of our fantastic team that we are able to achieve such recognition year after year. For the 2017 San Diego Beautification Awards, Eco Minded Solutions was awarded first place in Landscape Renovation Small. 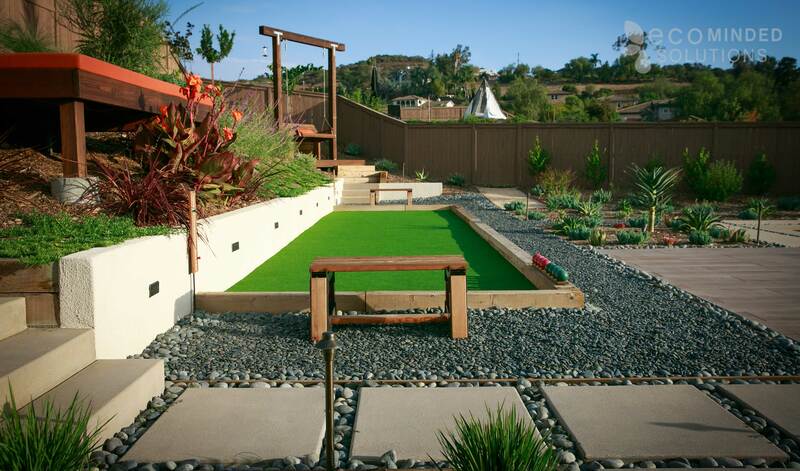 In the Landscape Renovation Small category, we took first place for our artistic design of this San Diego landscape. We designed this landscape for a professional artist who was craving a backyard space that could help foster her creativity in her Encinitas home. Add a pop of color with furniture and plants to create a dynamic space. Create a seamless transition between indoor and outdoor with complementary styles. Cresta Boulder accents contribute to the peace and zen of this outdoor space. We implemented a modern, minimalist style to match the interior of the home. The styling of the yard is intended to flow seamlessly from the indoor area, thanks to their large rear windows and sliding doors that integrate the two spaces. This landscape combines stone and plant elements, varied textures, and pops of color to come together to make a calm space that is sure to spark inspiration. To learn more about our previous award-winning projects, review our awards and accolades! Thank you CLCA – San Diego Chapter! We are proud to be recognized as a leader in eco-friendly landscape design for the third year in a row. We credit our core values of innovation, customer service, and attention to detail as the reasons for our continued success. If you are interested in starting a landscape design or custom home project in San Diego with Eco Minded Solutions, contact us for a consultation!